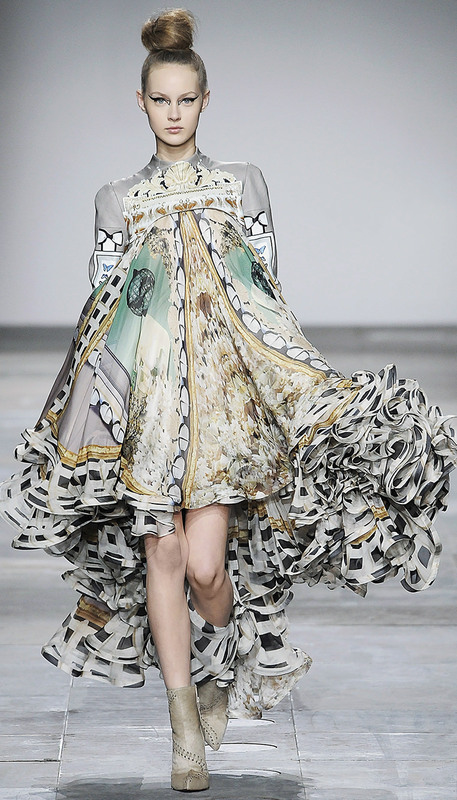 Mary Katrantzou’s autumn/winter 2012 collection. 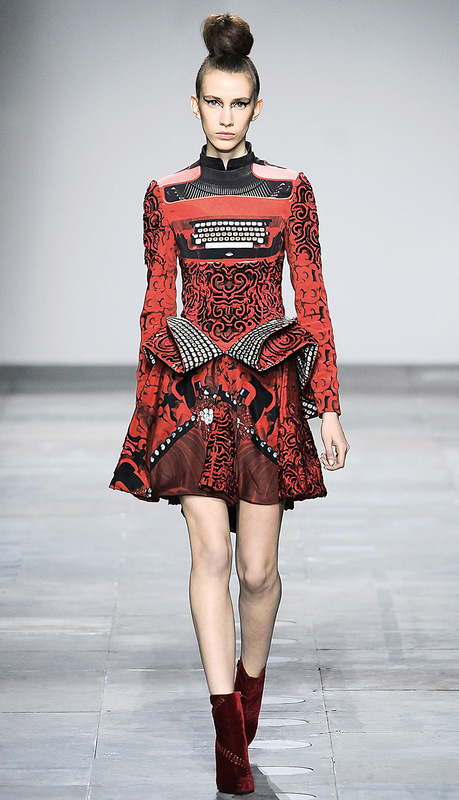 Despite her workaday uniform of head-to-toe black, Katrantzou is as colourful and effervescent in person as her autumn/winter 2012 collection. The seven-part collection is a whirlwind of digital patterns informed by elements of Victoriana, and it examines, deconstructs, and artfully reimagines everyday objects within a sartorial framework. Spoons, chess pieces, and a claw-footed bathtub all serve as inspiration, as does a Swiss-made Olivetti Lettera 35 typewriter from the 1930s. Even the HB pencil is raised from its humble desktop origins—with the help of French haute couture embroidery house Lesage, in its first-ever collaboration with a U.K.-based designer—to loftily embellish a vibrant yellow, tongue-in-cheek “pencil” skirt. 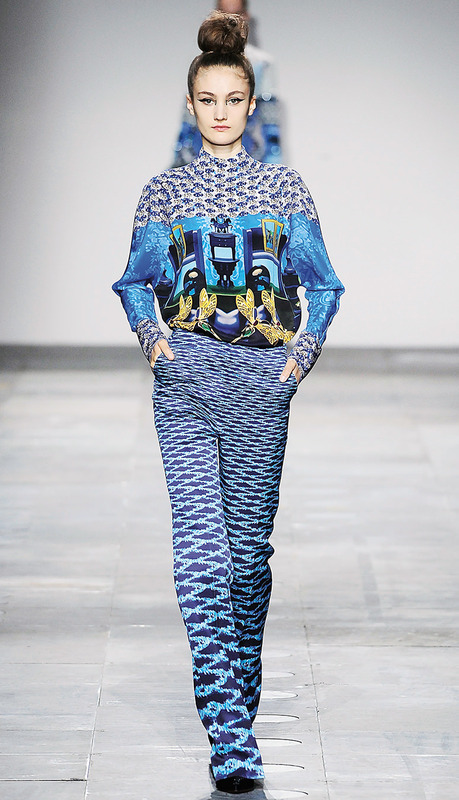 While it celebrates “anything that has a mundane purpose in life” in a riotous and exuberant manner, Katrantzou’s work can’t be dismissed as pop-art pastiche. Any whimsical flourishes are grounded by impeccable construction and a flawless, meticulous technique. 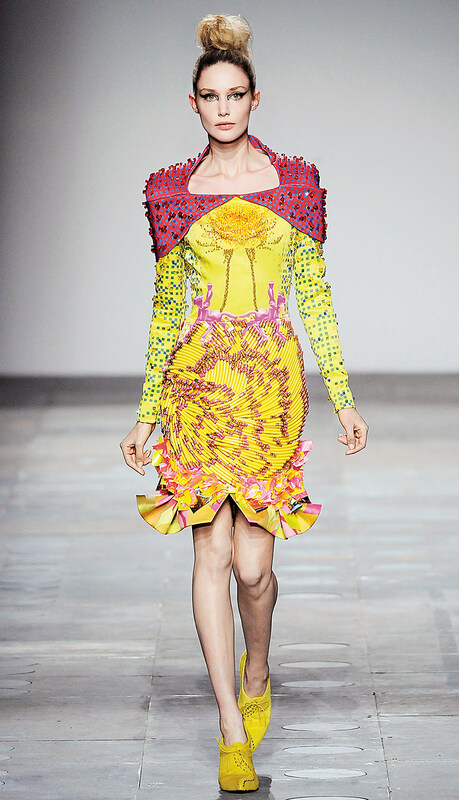 Katrantzou is a former Rhode Island School of Design architecture student with a master’s degree in fashion from London’s acclaimed Central Saint Martins College of Arts and Design, and although she may not have invented the medium of digital print on the runway, she has revolutionized its use. Not merely informed by a particular print, her signature prints inform every step of the design process. Rather than cutting fabric to its best advantage, she creates both the print and the garment at the same time in an organic and symbiotic manner. She combines textures and textiles that would give even a seasoned veteran pause, as evidenced by a silk chiffon baby-doll dress with a printed-leather yoke that seems to move of its own volition, even when laid out on a table. If demand for her work is any indication, that initial reticence has since resolved itself into a global hug. With her own signature lines for prêt-à-porter and couture, Katrantzou recently released two collaborative lines this past February: one with eminently affordable U.K. retailer Topshop and the other with iconic French handbag label Longchamp. “The [collaboration with] Longchamp sold so well that it allowed me to have a lot more confidence in the area of accessories,” she says. “It only makes sense because people who might not be comfortable with bold prints in a dress don’t need to fully commit to it with a bag or whatever. It’s important to allow them to buy independently that way. And because we started to work with bigger retailers who do have that [accessories] division under them, like the Bay in Canada, or, in London, Harvey Nichols or Selfridges, the time can only be right.” Is that, perhaps, a hint of an accessories collection for Katrantzou’s future repertoire? We can only hope.